The “Blue Wave” that broke in some midterm races around the country hit a “Red Wall” in the Ohio Valley, and while the Democrats will take control of the House in Washington, the partisan makeup of the Congressional delegations for Kentucky, Ohio, and West Virginia remains unchanged. In the region’s two Senate races, Democrats managed to hold on to Senate seats in Ohio and West Virginia, states that voted for President Trump two years ago. In House races, some deeply red parts of the region saw very competitive races in areas where voters went heavily for Trump in 2016, but no House seats “flipped” party control in the three states. 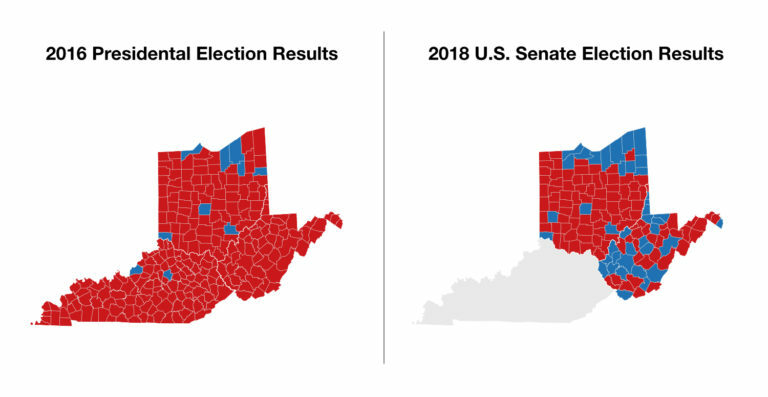 Ohio Valley ReSource data reporter Alexandra Kanik created these maps to provide a comparison of the 2018 and 2016 election outcomes in the region and to provide some insight into how the vote relates to the socioeconomic conditions in the region. The county-by-county data show the vote results compared to some important indicators, such as poverty, unemployment, and the percentage of people who have been able to obtain health care coverage. Health care concerns loom large in a region with some of the poorest health outcomes in the country. And despite a robust national economy, many parts of the Ohio Valley still suffer persistent poverty and higher than average unemployment. Those conditions could explain why these states that voted heavily for President Trump in 2016 showed more mixed results in this year’s Congressional races. Here’s how the midterm elections played out compared to key data on the region’s health and wealth. Democratic incumbents Sen. Sherrod Brown in Ohio and Sen. Joe Manchin in West Virginia retained their seats in states Trump won in 2016. Both Brown and Manchin campaigned hard on health care concerns and with the support of organized labor, zeroing in on household and workplace concerns. Manchin targeted healthcare concerns (sometimes literally, as in this ad). He tapped into the anxiety among many West Virginians who have pre-existing conditions that could make it difficult to get health coverage without the protections offered by the Affordable Care Act. The Kaiser Family Foundation estimates that if protections for those with pre-existing conditions were eliminated that would leave roughly a third of non-elderly adults in Kentucky, Ohio and West Virginia without affordable health care. That’s about 881,000 in Kentucky, 1.2 million in Ohio, and 392,000 in West Virginia. The expansion of Medicaid under the Affordable Care Act greatly expanded health care coverage for residents in the three-state region. Unions representing miners, teamsters, ironworkers, bakers, and many other workers and retirees worry that their pensions are in shaky condition, and both Brown and Manchin made support for pensions a priority. Retired union miners alone number more than 33,000 in West Virginia and Ohio. Other national political events late in the campaign also likely played a role in the region’s races. For example, Manchin was the lone Democrat in the Senate to vote for the confirmation of Supreme Court Justice Brett Kavanaugh. In some of the region’s most closely watched House races, such as Kentucky’s 6th District and West Virginia’s 3rd District, Democrats performed well in places that Trump won handily in 2016. But it was not enough for Democratic hopefuls Amy McGrath, in Kentucky, and Richard Ojeda in West Virginia. Both drew on their military backgrounds and emphasized labor and health concerns to appeal to red district voters. But incumbent Andy Barr narrowly held on in central Kentucky, and in southern West Virginia State Del. Carol Miller fended off Ojeda to claim an open seat. But even as the region’s Congressional delegations remain largely unchanged, those lawmakers will be returning to a radically different Washington. Senate Majority Leader Mitch McConnell of Kentucky will enjoy a slightly larger advantage in the Senate due to Republican victories in states such as Indiana, Missouri, and North Dakota. And the Ohio Valley’s handful of Democratic House members will enjoy new influence as members of the majority on important committees, something their party has not been able to do for eight years. The next Congress will not only be divided with different party control of the House and Senate, each chamber will also reflect the sharp political divisions on display in the midterm races. Many of the remaining moderates in both parties lost. Republican House members in more moderate suburban districts were the most frequent losers, and several Democratic Senators in red states were defeated. Sen. Manchin may well find himself feeling like a bit of an endangered species, a moderate Democrat, as the Republican majority lurches further to the right and his own caucus sorts out internal divisions. 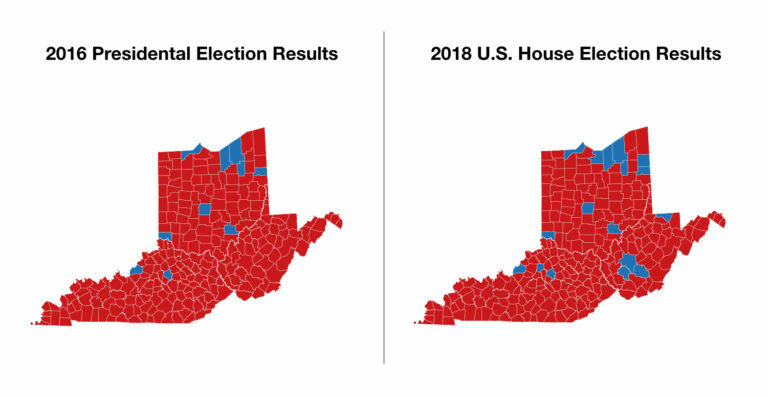 Meanwhile, Ohio Valley voters will be looking for action on several pressing issues related to the concerns they took to the polls and the measures of well-being reflected on these maps. For example, the clock is ticking on a proposal to shore up shaky pensions and a fund to support black lung benefits for sick coal miners. Thousands of people are anxious about the future of their health care and the future of their communities struggling to turn the economic corner and overcome a deadly opioid crisis. But the emerging political landscape in Washington is not one that promises to deliver much meaningful legislation.